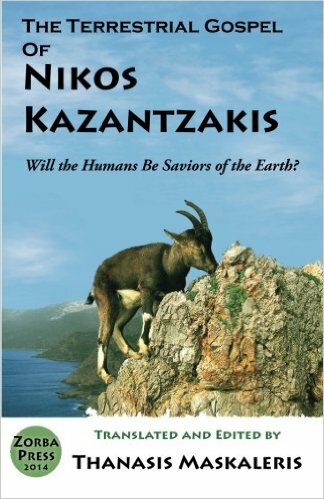 Will the Humans Be Saviors of the Earth? The Terrestrial Gospel is an anthology of passages selected from various books by Kazantzakis, centering on Nature and the workers of the soil. A powerful and poetic work that raises environmental awareness and calls us to compassionate action, the book contains new translations from the Greek originals to English, some original poems by Maskaleris, a Preface by Jean-Michel Cousteau, and an illuminating essay by ecologist, author, and film-maker, Michael Tobias. Love supports survival… Nikos Kazantzakis’ love of Nature inspired him to write beautiful hymns to Her and to the human life rooted in the soil — as the selections for this Anthology movingly demonstrate. Having grown up on the fascinating island of Crete — close to trees, animals and wild peasants — he absorbed and retained the terrestrial life in his soul, and made it bloom in brilliant descriptions throughout all of his works. These poetic tributes are not mere “décor” but a vital source of ever regenerative human life, biological growth, individual spirit and ecological community. It is a poetic vision that is at once communal, and global, from one of the 20th century’s greatest writers.